Oxlaiplatin is one of the platinum-based anti cancer drugs. It is used for treatment of colorectal cancer through its cytotoxic effects by inhibition of DNA synthesis in cells. 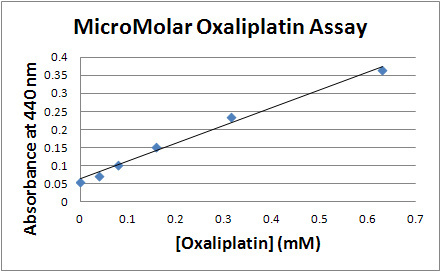 The MicroMolar Oxaliplatin Assay Kit (Catalog number OPT200) is designed for high throughput measurement of micromolar concentrations of Oxaliplatin. The assay is based on the light absorbance at 440 nm. The assay kit can be used for assays of oxaliplatin in drug discovery, drug development, pharmaceutical samples and biological samples. The MicroMolar Oxaliplatin Assay Kit (Catalog number OPT200) includes 4 ml of Reagent A, 0.080 ml of 50 x Reagent B, and 2 ml of 10 x Reagent C. It is for 200 assays using 96-well plates. Cuvettes may also be used for measurements.